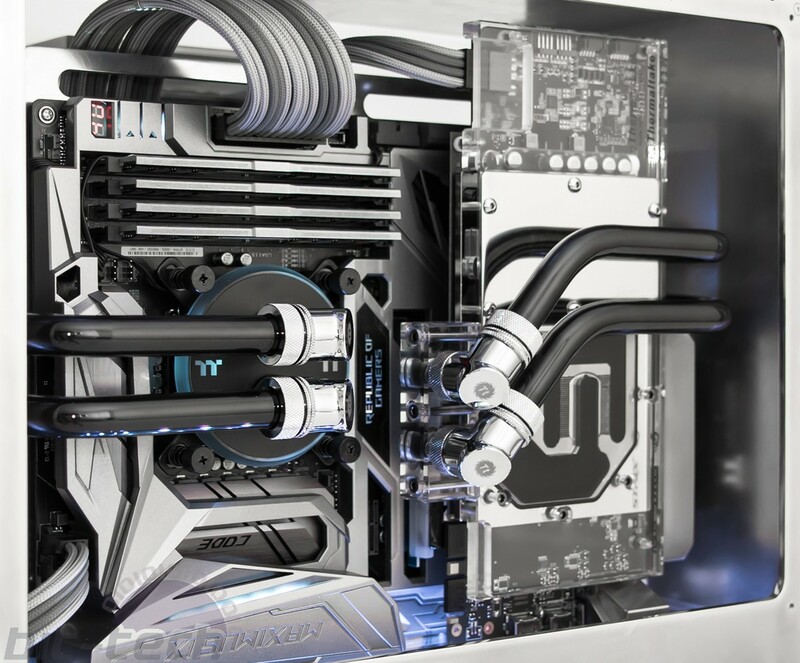 If there's one trend that's completely taken off in custom water-cooling in the last few years, it's hardline tubing. Over the last six years it's gone from being the reserve of only experienced enthusiasts working with local plastic suppliers and plumbing parts to a mainstream option that's even suitable for the adventurous beginner. We now have more choice than ever in this particular field, so it seems fitting (heh) that we update a little to keep with the times. Our modding forum actually hosted one of the original tutorials for this, written by esteemed member and modder Dan 'B Negative' Harper in 2013, so let's have a look and see if much has changed since then. Let's begin with a heavy hitter, the choice between which tubing varieties to go for. People fight over this preference all the time, but really it boils down to understanding the materials and knowing the shortcomings of each so you can make a more informed decision. PETG (polyethylene terephthalate glycol-modified) and Acrylic are both good materials for water-cooling. Which is better, however, will often come down to personal preference and which of the above options you value more. PETG is often marketed as beginner-friendly, largely thanks to it being easier to heat and bend initially. It's also very simple to cut with basic tools and is very much shatter-resistant for all those times you swing a hammer at your PC components. That said, I personally prefer working with acrylic, largely for the reasons above. Being clearer, acrylic can have an appearance closer to that of glass when lit well, and it's also less prone to being scratched in the packaging or when you're working with it. The catch is that you have to be more careful when bending it, as you need to heat it evenly to a higher temperature. You also don't want to work it too quickly, else you'll run the risk of microfractures appearing in tight bends. One point that does crop up from time to time is the event of a failure inside your loop. Whilst very uncommon, pump or fan control failures can lead to soaring fluid temperatures and pressures inside the loop. Under these conditions, PETG can deform, which can either result in an ugly bulge or, worse, a leak. I've built rigs with both PETG and acrylic, and I feel comfortable with either, so I wouldn't let this worst-case scenario alter things too much, because there's no guarantee that an acrylic loop would always keep it safe either. Another eternal argument is the use of angled fittings and adapters versus bending the tubing itself. This is purely preference; some love one and hate the other, others like a mix, and so on. My advice here would be to see which rigs you think you like the style of the most and choose what works for you. In some ways it's 'easier' working with lots of angled adapters, but the reality is you have to plan further in advance and invest a lot into those decisions. Size really doesn't matter from a performance perspective; this again comes down to personal preference. Some prefer the smaller 12mm tubes and others like big 16mm ones. Personally, I choose what works best for the rig I'm building. For a large build with lots of space, I would go 16mm, for an ITX rig I might choose 12mm, or if I wanted a more exotic tubing variety or fittings from a particular manufacturer, I would choose that. However, it is vital that you choose the same size tubing as the fittings you will be using. Hardline has no real room for error on this point, unlike flexible tubing. The vast majority of rigid compression fittings clamp around the outside of the tube. This means it's very important that you choose the same outer diameter (often referred to as 'OD') and the fittings. For instance 16/12mm tubing (16mm outer diameter, 12mm inner diameter) needs to be used with fittings designed for 16mm OD tubes. This is something that was safe to do with flexible tubing, but you cannot do this with hardline. Being perhaps half a millimetre out is a big change and could mean the difference between a safe system and a leaky mess. Double check which sizing system the fittings company uses first and go with that. Often it's just easiest to go with the same company for the tubing, as they'll produce the sizes for their fittings. You'll often find that European and Asian (such as EKWB, Bitspower, Thermaltake, or Watercool) companies will go with metric and US manufacturers (e.g. Primochill and Monsoon) will go imperial. This isn't set in stone, however, so just be sure to check the specifications for any products you intend to use.